Martiangirl has left the city. It was just a quick visit, but fun none-the-less. I sent her home with Jane's handmade-of-the-month. 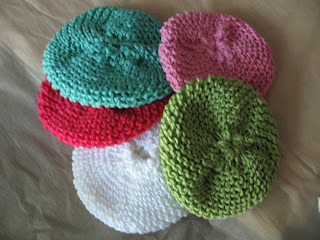 Made from cotton yarn they're designed to be used in the kitchen or bath as a little scrubbie. Trible...Trible...Trible oh how I love that word! And they're oh so lovely.